HOT POTS! - that's me! Look for the summer edition of Decks, Patios & Outdoor Living - it's a Better Homes and Gardens Special Publication. Debra Prinzing has written the article but all the container designs on the 8-page spread are mine and were photographed in our garden last September. I think you'll enjoy it. Join me at this fabulous community nursery as I demonstrate planting two unique containers with serious attitude! Discover new ways to use old favorites and drool over some of the newer plants now available. Signed copies of my book Fine Foliage will be available for sale after the talk. With a big 20% discount on ceramic containers and other surprise savings you'll go home inspired, loaded up with goodies and still have money left over! Because Duvall Nursery believes in looking after its customers they will even have refreshments to hand. Bring your neighbors, make new friends, support your local nursery and join in the party! (Did you notice that the Solomon's seal also has a burgundy stem?). The pretty leaf to the right is Mukdenia 'Crimson Fans' - a herbaceous perennials whose foliage turns vivid red in autumn. Looking for the perfect gift for Father's Day? What about a signed copy of my new book FINE FOLIAGE? 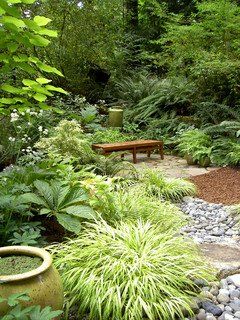 GOT A SHADY, SOGGY SPOT IN YOUR GARDEN? Can you believe that the image below is just that? Enjoy my recent article on Houzz which shows how a miserable garden corner was transformed into a delightful plant tapestry. Read all about it here. This is an exciting companion to our new book where we will share bonus ideas for unique foliage combinations - and just like the book, we will tell you 'why it works'. Consider it an appetizer - none of these lip-smacking combinations will be in the book. Last month your favorite post was Peanut Butter, Glass and WOW! Missed it? Click on the title o enjoy it again. While you're there be sure to sign up to receive these weekly beauties. Take a moment to sit back, enjoy photographs, see what has been happening in my own garden plus get links to the latest garden products and plants: all in bite sized chunks. Always fresh - take a look! As the Pacific Northwest regional garden writer for this great website I'm helping you stay on track with great design articles, fun plant profiles and more. Want to find out more about Houzz? One of my recent blog posts will tell you all about it and how to get started. to send via Facebook, Twitter and the like. Encourage friends and family to sign up so they don't miss out on special offers, plant news and local garden events! Got too much chartreuse and purple in your garden but don't want an 'ordinary' green? Check out this 'Old Fashioned' smoke bush. LOVE it. What is the Squish Factor?